SHOT Show isn’t just all about the firearms. Many companies that don’t sell firearms come to share products and the latest advances in the realm of self-defense. Around here, you know that we believe that everyone should find a self-defense tool that you are comfortable with and works for your lifestyle. So while time was limited for me, I did stop to check out a few brands non-firearm self-defense tools and wanted to share a few of those with you. What I noticed with a couple of these tools is that these companies are moving into integrating their defense tools with Bluetooth technology. I love that the market is seeing the benefit of how this type of app enabled response system adds an extra layer of help and assistance. Because let’s face it, when you’re in trouble you want all the help you can get. Be sure to check out my post on non-lethal defense tools for recommendations on what some of your other options are when it comes to defense tools. The TASER Pulse is one of my go-to non-lethal self-defense tools. When I can’t carry my firearm this is my second option. They have recently retired the original TASER Pulse (you can read more about it here) and have introduced an updated version, the TASER Pulse + (plus). Upon initial view of the tool itself it doesn’t look any different from the previous version. However, the difference comes into play with the latest integration with the Noonlight app through your mobile device. The Noonlight app notifies law enforcement of your location (via GPS) when the trigger is pulled. You can watch my Instagram story highlight to hear Sarah from TASER talk about the updated device. The SMT discount code applies to this upgraded version as well. You can use code SMT15 to save 15% off (shop TASER products here). Another great non-lethal self-defense tool to have as a tool in your “self-reliance toolbox” is pepper spray. It’s a convenient option to help protect against potential threats. 1) 3-in-1 Safe Escape Auto Tool (pictured far left): While this might look like your ordinary pepper spray this 3-in-1 tool also includes a stainless steel tip to use as a window breaker and the clip feature is actually a seat-belt cutter. 2) Smart Pepper Spray (middle; not available yet): Joining the line up of tools that are using Bluetooth technology, this pepper spray sends an alert and your GPS location to an emergency contact list and first responders when it’s deployed. It integrates with their own SABRE personal safety app. 3) Mighty Discreet Pepper Spay (right; not available yet): Just as good as the traditional SABRE pepper spray except this one is 40% smaller in size. So while it’s easy to conceal you won’t have to worry about sacrificing the strength of this pepper spray. Both of these striking-style tools might look like an average pen or key, which is what makes them so great. Williams Tactical Pen 2: I have a tactical pen already and personally I never know when mine is going to get confiscated by TSA so having an extra on hand doesn’t hurt. This one actually looks less tactical than mine but still feels just as strong. Williams Tactical Key: After seeing this and handling it in person, I’m a big fan of this tactical key. I currently have a TactiKey on my house key but I think this is a much better option in my opinion. It fits comfortably in my hand and since it’s bigger than a normal house key, it’s feels stronger and seems like it might do a little more damage than your standard house key. Bonus: It also doubles as a phillips screwdriver. So when your husband needs a tool, you can whip this one out. 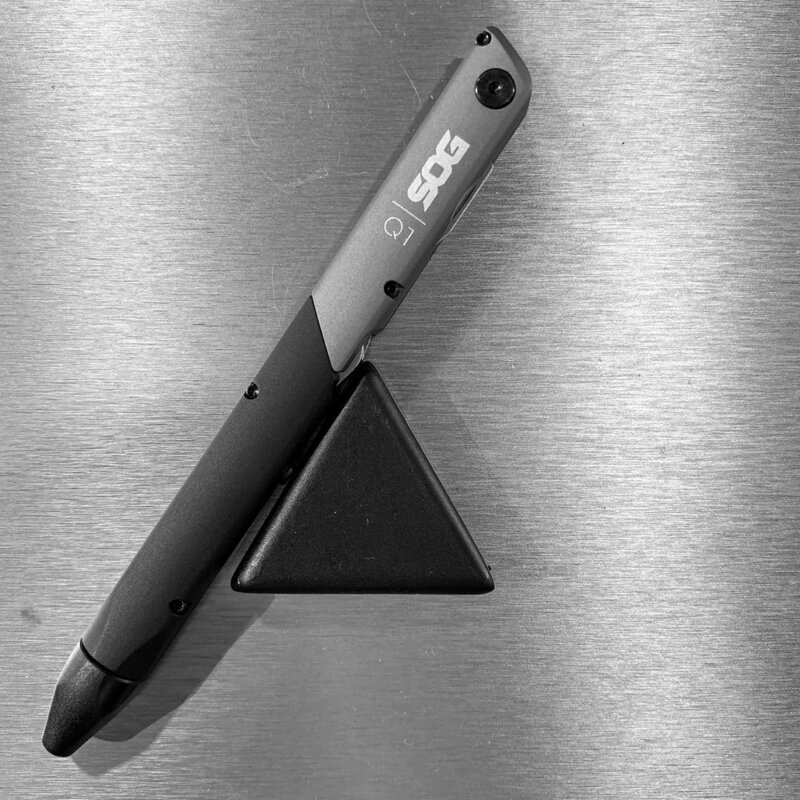 I have a SOG folding knife and what I would consider a traditional multi-tool but these slimmed down multi-tool batons caught my eye when I saw them at the SOG booth. The Baton Q1 version is a perfect every day tool for anyone - it’s a pen, a pair of scissors, flat-head screwdriver, and bottle opener all wrapped in to one discreet tool. 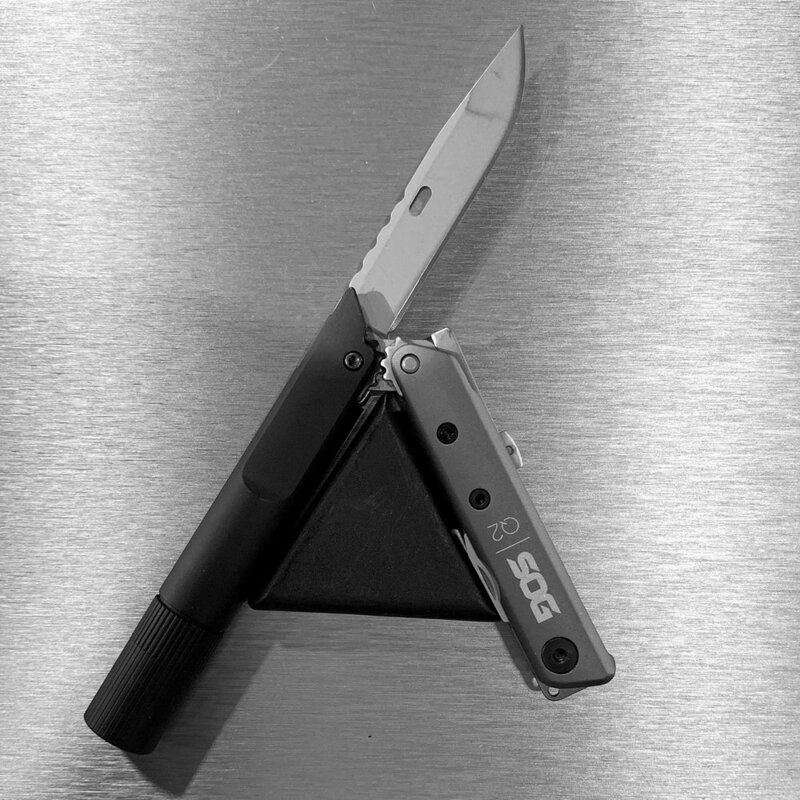 The Baton Q2 is has a pen, blade, flashlight, flat-head screwdriver, and bottle opener. They have two more in this series that have additional tools but for a minimalist style multi-tool, I’m loving these two options. Additionally, if need be you can always use one as improvised striking tool in a defensive situation.